My place is a 18th Century Pigeon Loft with character, history and charm. Beautiful exposed, the house has it’s own large garden surrounded by a typical low stone wall. There are great places to visit near by. Bike tracks, canoeing the famous Gorges – climbing, riding, trekking, you name it, it’s there! You’ll love my place because of the peace and quiet, the starry nights, the beautiful scenery around you. My place is good for couples, families (with kids), and furry friends (pets). Carlo is an Architect and I am a Counselor in a high school. He is Italian and I am Australian. We currently live in Genoa, Italy. It was love at first sight when we saw Le Pigeonnier and decided to buy it giving it no further thought. Since we have become it's proud owners, we have, over the years, added and changed a few things without upsetting the original structure. We intend to retire there but, for now, are more than happy to share it with guests who, we hope, will enjoy it as much as we do when we come and stay there ourselves. Staying in Le Pigeonnier let's one 'get away from it all' and yet the area is full of amazing villages, sights to see and great wines too ! 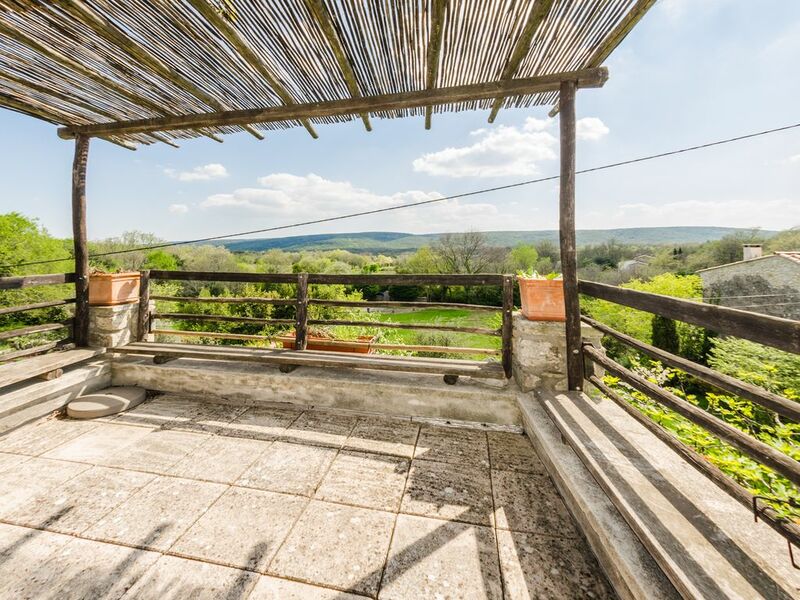 The view from the terrace overlooks the rolling wooded hills and valley. It lies in a “Parc Naturel” and is therefore in a quiet, calm location. It has it’s own large garden surrounded by a typical low stone wall. Relaxing evenings can be spent by the Barbecue we provide! Just a 45 minute walk through the woods and you can enjoy a swim in the Ardèche River!Depending on the season and the water level, you can even lie on the beach along the shore! The climate of the Ardèche region makes it an ideal spot for out-of-season vacationing too! The numerous cultural, gastronomic and natural attractions of the area make it interesting for one and all. Sports lovers can enjoy beautiful bike tracks, canoeing – the Gorges of the Ardèche are world famous – climbing, riding, trekking, you name it, it’s there! We spent a delightful 2 weeks at Le Pigeonnier. The house is well equipped and furnished. It has a rustic charm and the room arrangements work well for a single family (it may be a bit more awkward for more than one family as you must pass through the twin room to get to the largest double bedroom). Countryside is heavily wooded and there are nice walks to the village (20mins), river (30 mins) and other parts from the village. Eating on the terrace is lovely and although the parasol needs replacing it still worked ok.
Our only minor criticism was that there was initially no working garden furniture although two new sun loungers arrived after a couple of days but this wasn't really sufficient for 5 of us. Not a massive issue as we had brought rugs. Tout s'est très bien passé au pigeonnier. Nous avons eu du plaisir à prendre nos petit-déjeuners sur la terrasse et à faire des grillades dans le jardin. Tout était en ordre dans la maison. La descente depuis les Crottes jusqu'au bord de l'Ardèche vaut la peine: nous avons pu passer des heures au bord de l'eau dans des endroits déserts (à l'exception de quelques canoés). Nous sommes ravis que votre séjour au Pigeonnier c'est bien passé et que les environs vous ont plu. Nous espérons de pouvoir vous recevoir encore car l'Ardèche est une région pleine de beauté et de surprises agréables à découvrir. Nous vous remercions d'avoir pris le temps d'envoyer un commentaire ! Lieu au calme avec une très belle vue, loin de toute animation. Diners tranquilles sur la terrasse face à la nature. Ce hameau est très mignon. Des voisins belges un peu austères : compliqué parfois de se garer car leur voiture gêne le passage : on a presque l'impression de les gêner. Si c'est un point important pour faire votre resa : il n'y a pas de Wifi malgré ce qui est écrit dans l'annonce. Un petit conseil, emportez répulsifs pour les scorpions, on en a attrapé 8 dans la chambre des enfants et la salle de bain. Leider ist der hier auf der deutschen Seite von homeaway genannte Internet-Anschluss nicht vorhanden. Wenn man sich darauf einstellt, extra auswählt und sich entsprechend Arbeit mitbringt, blöd. Ruhige Lage: wirklich abseits. Ruhezeit ab 22h wird von Gästen erwartet …..naja. Also wer absolute Stille sucht, sollte sich wirklich etwas in Alleinlage suchen. "Le Hameau des Crottes" ist ein kleiner Weiler. Und einem einzelnen Campinggrundstück mit abendlichem lauten Gebären und Stromaggregat ….bruuuuumm. Der große Balkon ist toll. Allerdings für sensiblere Gemüter zu beachten: Man guckt dauernd auf eine Mauer, an der vor 72 Jahren 15 Menschen hingerichtet wurden. Es ist gut, dass dieses Denkmal existiert, aber es ist vielleicht nicht für jeden leicht, damit umzugehen. Barjac ist ein sehr schöner Ort in 20 Minuten Entfernung. Campingplatz „Milles Etoiles“ in Les Crottes, etwa 3km. Abends einen großen Topf Moules Frites oder eine tolle Pizza zu angenehmen Preisen bei guter Qualität essen! Unbedingt anschauen: Aven d`Orgnac, La Grotte. "Excellent séjour au Pigeonnier. Maison fort agréable sur plusieurs niveaux, le temps magnifique nous a permis de profiter pleinement des deux terrasses, une couverte et l''autre avec vue sur la campagne. Environnement très au calme, avec les bruits de la nuit. Les gorges de l''Ardèche peuvent être atteintes à pied en partant du hameau. Excellent contact avec les propriétaires ( à distance ! ) et merci à Sylvie pour son accueil. Pensez à garder vos restes pour les poules, cela amuse les enfants.En résumé, un excellent séjour en dehors des périodes estivales. serge"
Het huis was niet schoon. M.n. de keuken met inhoud en één badkamer waren niet acceptabel; veel (oud!) vuil en kapotte zaken. Geen meubelen voor in de tuin aanwezig, dus had je niets aan, en terrasmeubels waren deels kapot. "I am both surprised and disappointed that our guests have chosen, eight months after their stay, to write such a negative testimonial of their experience in our home : all the more so because to date, no one has complained and we have had only highly positive testimonials, both published on Homelidays and in our Guest Book at the house. At the time of their stay, we had already discussed the situation at length via an amiable email and phone exchange where I also apologized on more than one occasion for the mishap and I frankly thought the two issues raised had been settled. The main points of contention mentioned in this extremely negative testimonial, as far as I can understand concern some items of crockery that had been put away in the cupboard - and we are totally confident that it was unintentional - although they had not come out of the dishwasher perfectly washed. The other complaint seems to be about a tap in one of the bathrooms which unfortunately was a little loose. Ironically, one of the emails I received began with "I don't want to make a big thing out of this...."."